Discussion in 'iPhone and iPad Games' started by ojtitus, Jun 19, 2015. ARMAGEDDON MUST NOT BE LOST Available in English, French, German and Spanish! "Armageddon, a world whose name has become a byword for war and destruction on a massive scale…" -Lord Commander Solar Eugenian There is no peace amongst the stars... It is the 41st millennium and there is only war! We live in the Imperium of Mankind, the greatest empire the galaxy has ever known. Millions of planets united in their adoration for the Emperor. But we are not alone… A massive space hulk is drifting towards Armageddon, and the planet is threatened by the war hungry brutal Orks. Welcome to the battlefield! 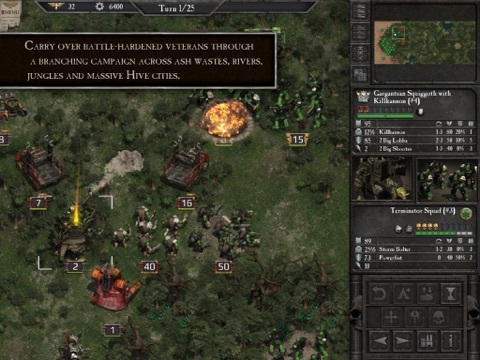 Warhammer 40,000: Armageddon is a fantasy war game set in the Second War of Armageddon. You take the role of defending the planet as the Imperium of Man against the Ork invaders. Throughout the campaign you will also be joined by three chapters of Space Marines: the Salamanders, Blood Angels and the Ultramarines. 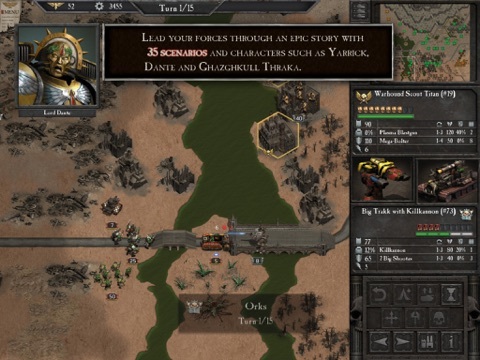 In this hex-based, turn-based strategy game, players will lead the Imperial forces of the Armageddon Steel Legion and Space Marines from a variety of Chapters against the Ork invasion through over 30 scenarios, on the hostile terrain of the planet and its gigantic Hive Cities. 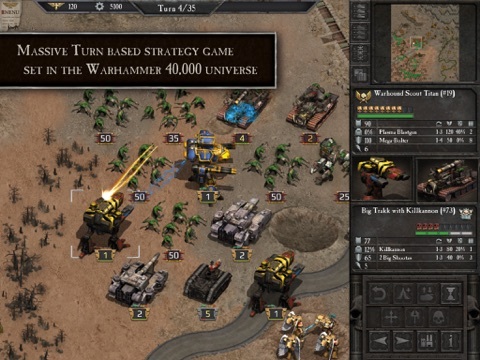 The game features a complex plot, involving known characters from the Warhammer 40,000 universe and while advancing through the campaign, the player will have the ability to carryover his core force from scenario to scenario. Players fight alongside Commissar Yarrick and Commander Dante against the cunning Ork Warboss Ghazghkull Thraka and carry over battle-hardened veterans from scenario to scenario, using their experience and upgrading their equipment. On top all this extensive modding options are available through a powerful and easy-to-use game editor. Features:	•	Large branching campaign with 30 major scenarios, plus additional 5 tutorial scenarios that explore the story in detail. •	Hundreds of hours of gameplay fun with huge replay value and several difficulty settings.The game portrays the Second War for Armageddon in great detail, from the initial Ork landings to the final liberation of the planet. •	Fight alongside Commissar Yarrick and Commander Dante against the cunning Ork Warboss Ghazghkull Thraka. •	A complex plot, which can develop during a mission, right in the middle of battle, creating an engaging story line with unexpected twists. •	Meet several iconic characters like Inquisitor Horst, Governor Von Strab and many more, who will guide you through an epic scenario based adventure all with their unique voice-overs. •	Players lead Imperial troops of the Armageddon Steel Legion, with supporting assets from a number of Space Marine chapters against the ferocious Orks. •	Carry over battle-hardened veterans from scenario to scenario, using their experience and upgrading their equipment and weaponry. •	Detailed combat model with custom terrain, cover and morale effects. •	Guide your troops on Armageddon`s hostile ash wastes, through treacherous volcanic canyons, over acid polluted rivers, through dense jungles and through massive Hive cities. •	300+ unit types representing Armageddon Steel Legion, the Orks, Blood Angels, Ultramarines and Salamanders Space Marine chapters and even Titans! •	Multiple weapon systems per unit, each with their unique stats and graphical effects. 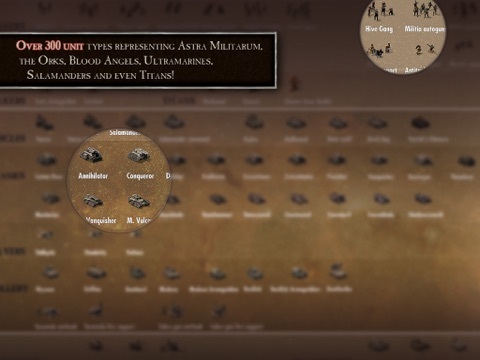 •	20 different unit stats plus many unique special traits and abilities. 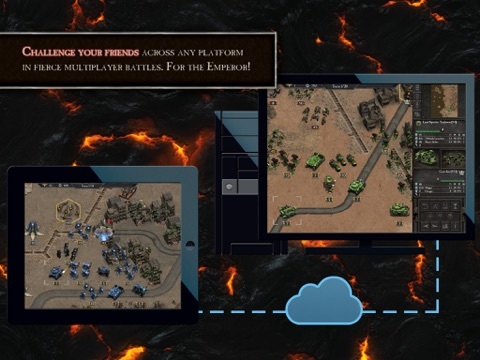 •	Toggle options to set the game to your own liking like to enable/disable: Fog Of War & Undo Moves. •	A separate set of maps are designed and balanced specifically for asynchronous multiplayer via Slitherine's PBEM++ system. •	Play as either Orks or the Imperial forces in multiplayer. •	Includes a Hotseat mode. Anyone managed to download this yet. On the uk App Store when trying to purchase it states the item is no longer available. I also keep getting the item is no longer available message. I guess I'll have to wait until morning to pick this up. I am unable to download it as well. Sooner or later I suppose. The unable to download has been a thing over the past few weeks. Don't know why apple hasn't gotten it together yet. Seems like pretty much most if not all new release apps over the weds/Thursday release time period suffer from it. I'd imagine there would be some lost app sales generated by the inconvenience for one reason or another. Anyway. It'll be available soon. Does did play like panzer corps? Slitherine don't seem to believe it exists. (They have a couple of universals). How epic would this be to have on a truly portable device. Yes mate it does. I took part in the Beta, it's a great game with hours upon hours upon hours of gameplay! My tip for this is "keep your units alive" as they stay with you through the campaign. The solution: Buy it on your PC with iTunes. That works. After that you can redownload it direct on your iPad. Is anyone able to do the ipa trick on this and report back if it runs on iPhone. So you mean you're gonna....? Right..? Who does buy games for this price on App store?! I do after reading some reviews... . I do! Why not? This is a full game, same as the PC version, so where is the problem?